This Wednesday, September 17, the Austin Music Foundation (AMF) celebrates the grand opening of their new Creative Media Center (CMC)at the Boardwalk Bazaar, a part of the newly opened South Shore District off of Lady Bird Lake. For those who dont know, the CMC is an incredibly valuable resource for working musicians in Austin, Texas. Whether musicians need to design a poster for their upcoming event, have questions on how to book a tour, or would just like to consult with an industry professional, AMF provides free assistance to all Austin musicians. Boardwalk Bazaar. Photo by Austin Music Foundation. The Foundation has partnered with Austin Monthly to host the Boardwalk Bazaar and celebrate the grand opening. 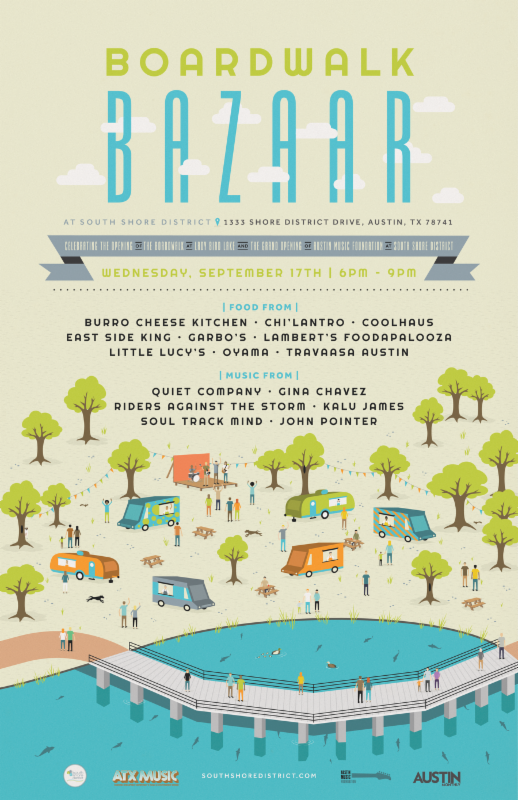 This celebration, from 6-9 p.m. on September 17th, is free and open to the public, and will feature some of Austins favorite food trucks (15 of them to be exact), cocktails by Titos Handmade Vodka, and of course, local and live music including a killer lineup: Quiet Company, Gina Chavez, Riders Against the Storm, Kalu James, Soul Track Mind, and John Pointer.